There’s a certain kind of film which tends to walk away with the Oscar for best foreign film each year. It’s usually an ‘issue’ movie which is just about exotic enough for the Academy to feel like they’re rewarding something different, whilst also playing by the rules and being safe and generic enough to avoid alienating those who wouldn’t normally see a foreign language film. 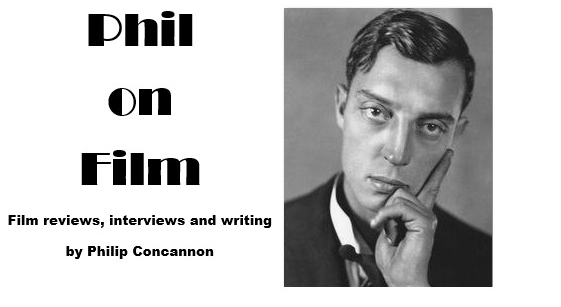 The ridiculous vagaries of the Academy’s selection policy, in which the various countries put forward one film for consideration, seems to result in every nation selecting the film which most closely meets these requirements. The nominations therefore have tended to be rather bland affairs, and this year was no exception. There was no sign of such acclaimed films as Caché, 2046 or Head On among the nominated films; and the Oscar instead went to Tsotsi, a South African film concerning the redemption of a violent gangster. Tsotsi has been adapted from Athol Fugard’s novel of the same name, a book published over a quarter of a century ago and set in the 1950‘s. Director Gavin Hood updates the story to modern day Johannesburg and sets most of the action in the decrepit shantytowns on the edge of the prosperous city. The film opens with a bang. Tsotsi (Presley Chweneyagae) is a small-time teenage hoodlum who, along with his three cohorts, heads out into the city to commit their daily crime. The pounding soundtrack gives an visceral charge to the sequence as Tsotsi leads his gang through the streets, strutting imperiously and giving the finger to those who make mocking comments as he passes. Once they reach the train station they soon identify their prey; a heavyset gentleman who is failing to be discreet enough as he flashes the cash from his newly-acquired pay packet. The following robbery is superbly orchestrated by Hood. As Tsotsi and his gang follow their victim he slowly begins to realise - only too late - what a grave situation he is in. The crime, which is committed on a packed train, is a brilliantly tense and riveting piece of filmmaking. Shortly afterwards Tsotsi beats his friend Boston to a pulp for daring to suggest that he has some human feelings under his cold façade, and he then steals a car, shooting the female owner in the process. It seems that Tsotsi is setting itself up as a grim examination of life on the crime-ridden streets of South Africa, and then it suddenly goes soft. As Tsotsi races away in the car, he hears an unfamiliar sound coming from the back seat - the owner’s baby is still in the car. After considering the possibility of leaving the baby by the side of the road, Tsotsi decides to take him home, despite having no idea how to take care of a child. The first cracks in his heartless demeanour begin to appear. Tsotsi begins the film as a brutal, vicious character; happy to dish out severe punishment to all and sundry without a second thought. As the titular character, Presley Chweneyagae gives a superb performance, his baby-faced appearance (recalling Richard Attenborough’s ‘Pinkie’ from Brighton Rock) belying his savage nature. But Tsotsi’s path to redemption is as hackneyed and schematic as any old Hollywood melodrama, and the film’s violent edges are gradually smoothed out as the character undergoes a drastic change in personality. The early scenes of Tsotsi attempting to deal with his new arrival will horrify any parents watching. He carts the child around in a shopping bag, wraps newspaper around him as an impromptu nappy, and at one point the leaves the baby under his bed for the day only to find him covered in ants when he returns. Clearly Tsotsi is unable to provide for the child alone so he drags a local woman named Miriam (Terry Pheto) into the situation, forcing her to give up her breast milk at gunpoint. While this may sound like an unpleasant tale, the inevitability and simplicity of the film’s narrative never leaves us in any doubt that the baby will be fine throughout, and that Tsotsi will turn out to be just a big softie at heart. Tsotsi’s sudden change of heart is bemusing. Just the presence of this child in his life appears to be enough to make him melt before our eyes and Gavin Hood doesn’t attempt to make his about-face any more plausible for us, clearly expecting that we’ll take this cornball stuff at face value and be too tearful as the credits roll to question what we’ve seen. But Hood’s handling of this material is far too trite and unconvincing to really have any impact. This is a shame, as Tsotsi is at its most effective when detailing the character’s darker side. Tsotsi barely speaks for the film’s opening section, letting his dead-eyed gaze do the talking for him; and certain scenes, such as his intimidation of an elderly cripple, or the flashback in which we see his alcoholic father at his worst, are compelling and brilliantly handled. The performances are also top-notch throughout, with first-timers Chweneyagae and Pheto giving effortlessly convincing displays, and there’s able support from Mothusi Magano and Kenneth Nkosi as two members of Tsotsi’s gang. Unfortunately we know exactly where Tsotsi is going as soon as he picks up his inconvenient little bundle of joy, and it offers few surprises to maintain audience involvement as it travels along its straight narrative rails. The film ends in an avalanche of sentimentality, with Tsotsi completely (and arbitrarily) renouncing his wayward life; and the baby is reunited with his family during a shamelessly manipulative, tear-stained finale which left me distinctly unmoved. 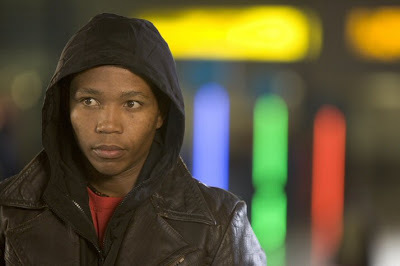 “Decency” is a word which crops up occasionally in the film, as Tsotsi’s friend Boston asks if he knows what the word means. Gavin Hood certainly knows the meaning of the word; his film is so avowedly decent that the potential shown in the electrifying opening sequence is completely washed away to leave us with yet another unremarkable, middlebrow film about a bad guy with a heart of gold. You can see why it won the Oscar.